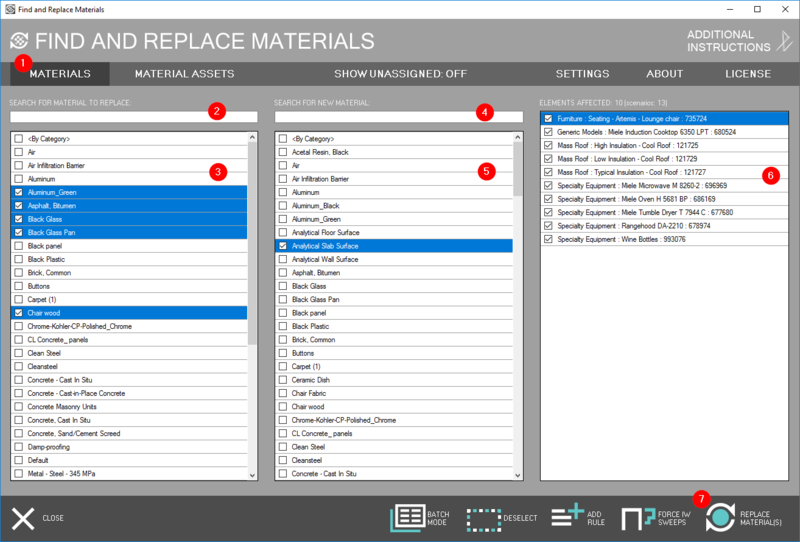 The Find and Replace Materials for Revit plugin finds assigned materials in a project document and replaces them with other materials selected by the user. 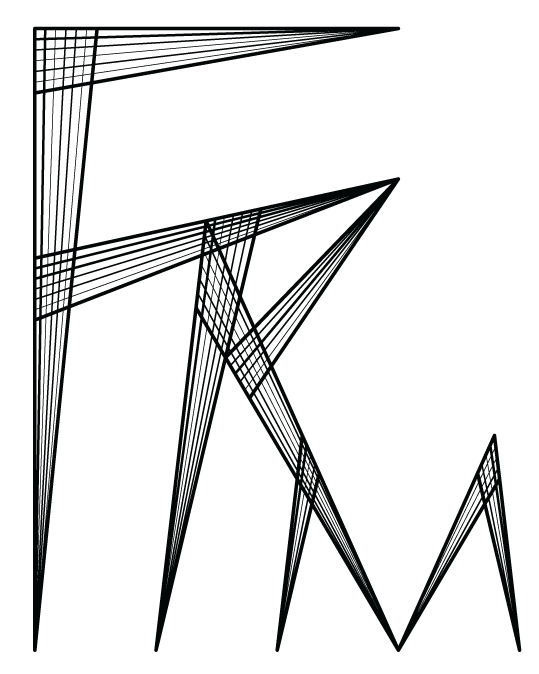 Multiple materials can be selected to be assigned to a single material. Additionally, material assignment rules can be saved to a CSV file within the “batch mode” for later use. Option to replace materials/assets for selected elements only. Dimensions hosted on material fill patterns disappear as the new material’s fill pattern is different from the old. Hosted elements might un-host from parent element when parent material changes. API limitations: access to the rail structure materials is restricted and it cannot be supported until Autodesk allows access. Handrails and guardrails within the rail family is supported. Families: materials that are not assigned to parameters within families will be omitted in the project environment; this includes model-in-place families. 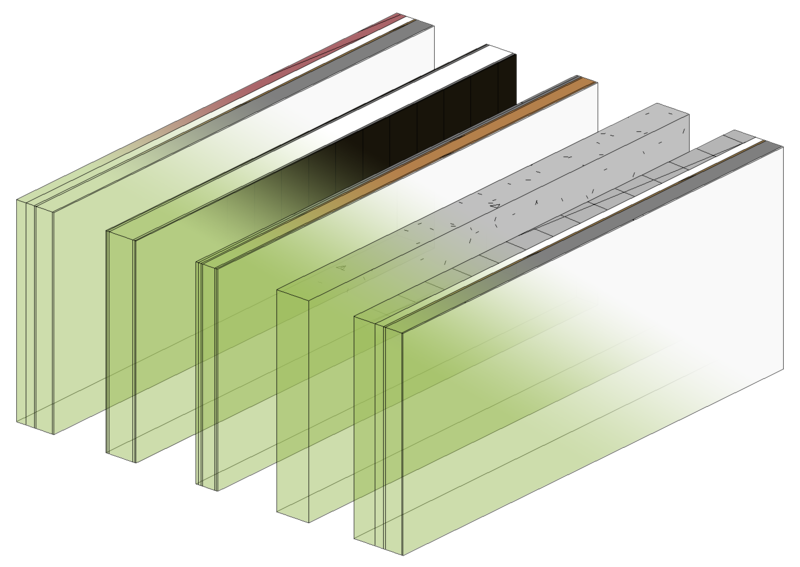 Physical and Thermal Material Assets: when replacing these assets, the list of available replacements is based on the assets already assigned to materials. Physical and thermal assets loaded into the project that are not assigned to materials are not available for selection. Set MATERIALS or MATERIAL ASSETS mode. Search for material(s) or asset(s) to be replaced. Select material(s)/asset(s) from list. Multiple selection is allowed. The elements affected list will update per the current selection. Search for a new material/asset to replace the existing material/asset. Select new material/asset. Only one material/asset can be selected. Optional: change affected elements selection. Press the REPLACE MATERIAL(S)/ASSET(S) button to run the command. Press the BATCH MODE button. Press the ADD RULE button to add current selection to rule list. The elements affected list will update per the batch mode rule list changes. Press the DESELECT button to unselect materials/assets above. Repeat steps 2 through 7, until rules are setup. Press the BATCH REPLACE MATERIAL(S)/ASSETS(S) button to run the command. FEATURE: Run in Family Editor environment with nested family support. Improved graphic user interface and graphic performance. Introduced new monthly subscription tier. FEATURE: Find and replace material assets (Appearance, Physical and Thermal) in standard and batch processing modes. FEATURE: Show Unassigned Materials toggle for the materials to replace list. Updated the Single License system to allow for transferring licenses. Introduced an alternate licensing solution for volume purchases: Enterprise Licenses. 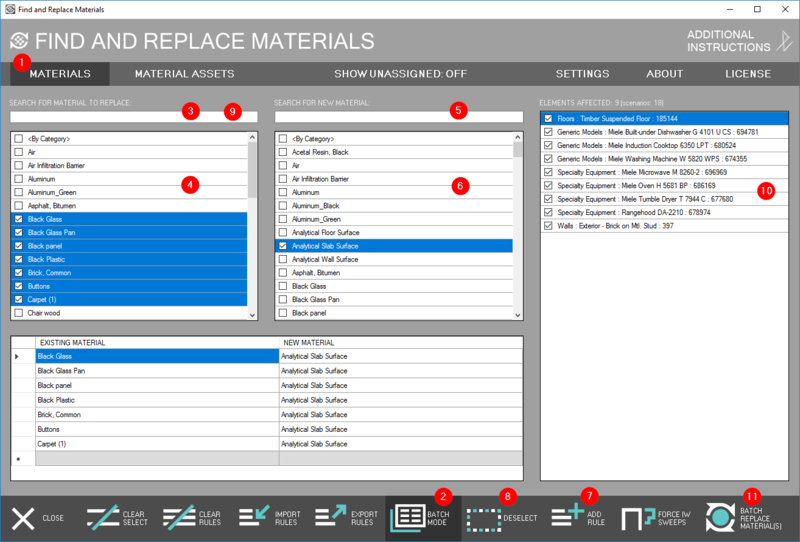 FEATURE: Find and replace materials batch mode. FEATURE: Export/Import batch mode material rules to CSV file. FEATURE: Experimental "Force Integral Wall Sweep" feature implemented. 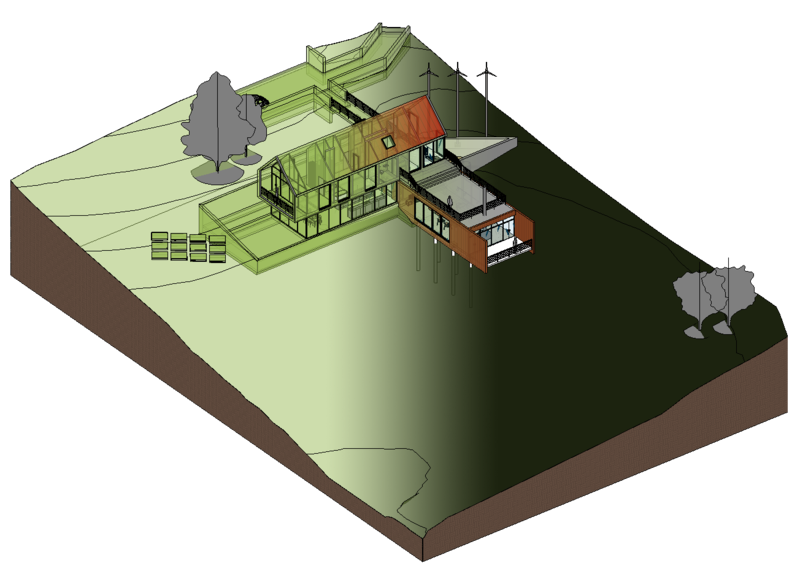 Eyedropper tool for quick/graphic material selection from model view (similar to SketchUp). 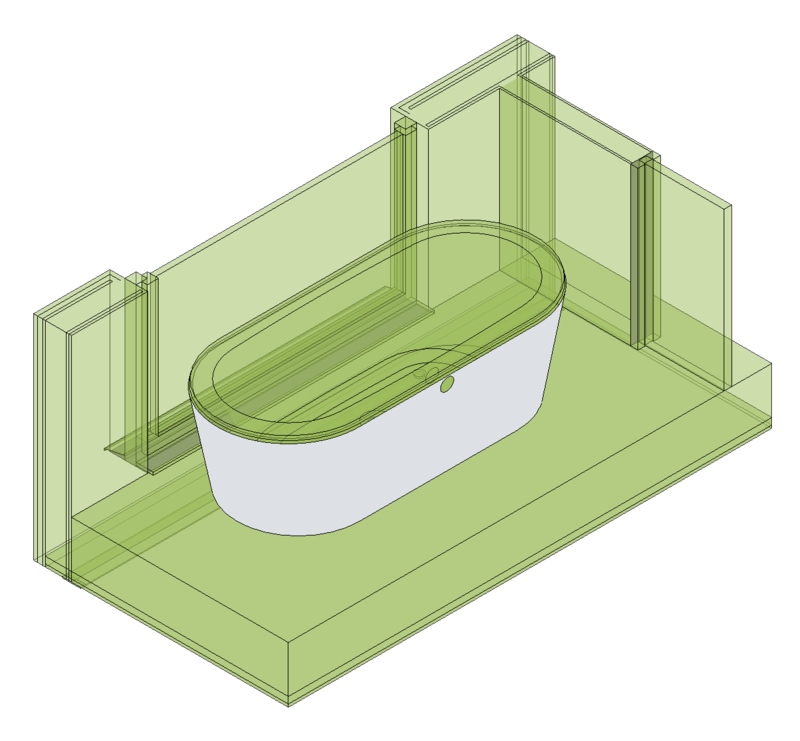 Paint bucket tool for quick/graphic material replacement from model view (similar to SketchUp). Replacing materials using the transfer project standards API. Option to switch between engine modes. This mode will bypass all element specific API limitations, but will sacrifice the ability to control and preview which elements are affected. Option to keep plugin open for multiple iterations. Running the plugin will not pause the Revit application. Show/orient to affected elements selected. Add rails structure support. Contingent on Autodesk's release for Revit API access to this element. Fully support integrated wall sweeps. Contingent on Autodesk's Revit API update to error correct the behavioral anomaly for this element. Download the plug-in installer from the Autodesk App Store. Run the installer: Revit must be closed. For single licenses, the plug-in will run in Trial mode until it is activated. You may need to restart the Autodesk product to activate the plug-in. To uninstall this plug-in, click Control Panel > Programs > Programs and Features (Windows 7 / 8 / 8.1/ 10) just as you would uninstall any other application from your system. You can downlaod the full plugin by following the download link below. The plugin will work as a trial for 30 days after installation. 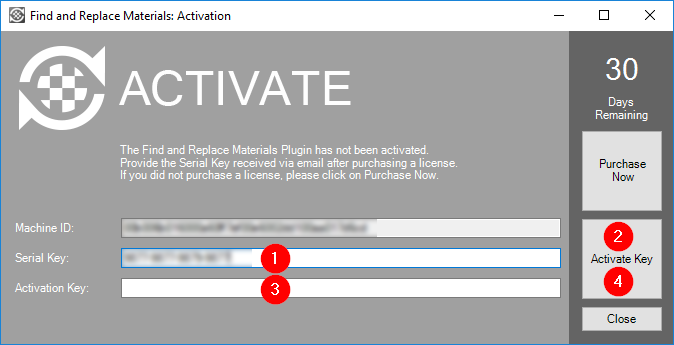 Please activate the plugin within this period by using the serial key provided when purchasing a license. To purchase a license click on the link in the license section below. There are two types of licenses for the Find and Replace Materials for Revit plugin: Single Subscription License & Domain Subscription License. The Single Subscription License is activated on a single machine, with the option to deactivate for transferring to another machine. The Domain Subscription License, can be used on an unlimited number of computers within a domain. Both licenses are subscription based licenses for the Revit versions supported: Revit 2019, Revit 2018, Revit 2017, Revit 2016. You can purchase a license by following the links below. Paste Serial Key from email received after purchase. Press the Activate Key button. MANUAL ACTIVATION: If there is an internet connection error, paste the activation key received via email. MANUAL ACTIVATION: Press the Manually Activate Key button to finalize activation.